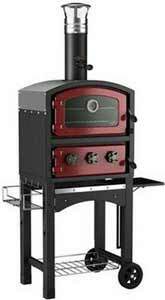 Welcome to our range of beautiful Fornetto wood fired ovens and smokers. With different colours, and features that you'd expect to see on indoor ovens, the Fornetto range raises the bar on wood fired cooking and cooking outdoors. Featuring solid cast iron doors, stainless steel oven interiors and a separate fire chamber, the Fornetto ovens offer a safe and easy way of creating authentic pizzas, amazing roast meats, baked breads, pastas and desserts or smoking an endless variety of foods in your own backyard or patio.